Esta es la version en ingles de la pagina del Ajedrez Aleatorio Moderno. 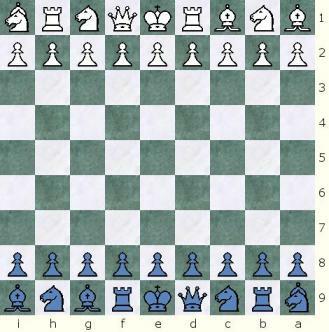 Modern Random Chess (MRC) is a blend of concepts from Gabriel Vicente Maura's 1968 Modern Chess (9x9 setup, Reverse Symmetry, symmetric castling to either side, an extra pawn, the Prime Minister (B+N) and a Bishop Adjustment Rule) with some random concepts & the castling formula from Fischer Random Chess (FRC). There are 15,120 different legal starting positions in Modern Random Chess, one of which is Maura's Modern Chess initial layout. If Maura's original Modern Chess position (MRC position #6,944) was randomly selected, it can be played with the rules for Modern Random Chess, just like the original game. In a reverse symmetrical setup the piece at the square a1 for White, is the same as the piece at i9 for Black. The piece at b1 for White is the same as the one at h9 for Black, and so on. 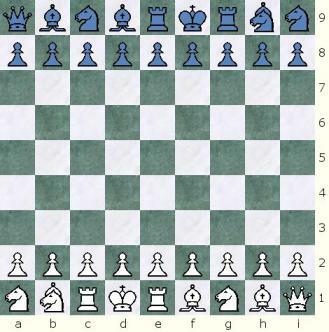 The Pawns are in the second row of each player's side. 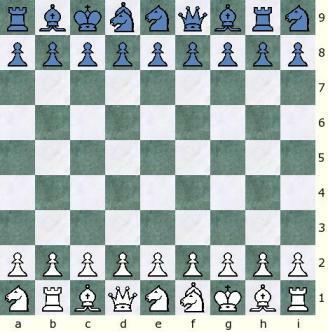 In the MRC position on the left, from White's point of view, the Bishops are both on his leftmost dark squares, his Queen is to the right of the King, his Prime Minister is on his right corner, and so on. Also, from White's point of view, his opponent's Minister is on the opposite corner across the diagonal as his own, the opponents Queen is across the board from the Rook to the left of his King, and you could continue to describe the position of the opponent's pieces in relation of White's own. Now look at the same MRC position in the diagram on the right, but from Black's point of view. Every single observation made from White's point of view above, applies as well to the point of view from Black. That's reverse symmetry! 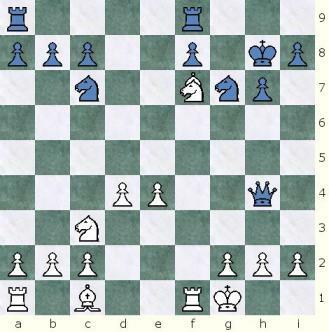 Most Orthodox Chess rules apply, including the objective of the game, the way pieces move and capture, en passant, check, checkmate, and the various draw situations (i.e. 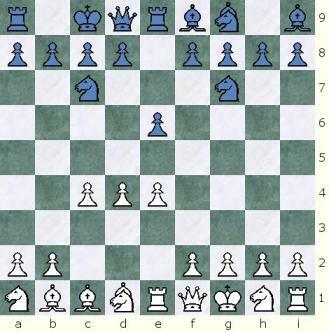 stalemate, insufficient mating material, threefold repetition, 50-move rule). 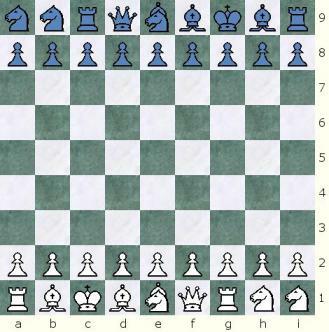 Pawns may promote to a Queen, Minister, Rook, Bishop or Knight. Modified Castling rules are below, as well as the new Bishop Adjustment Rule. 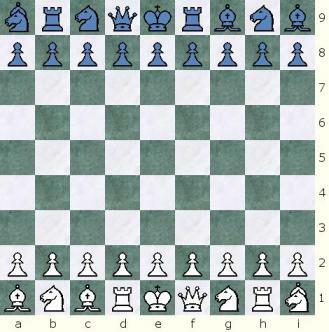 The MRC castling rules are based in the Fischer Random Chess rules. After castling, the rook and king's final positions are exactly the same positions as they would be in Maura's Modern Chess. 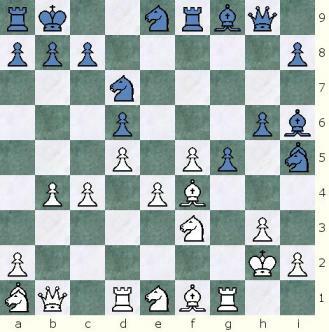 Thus, after c-castling (notated as O-O-Oc), the King is on the c-square (c1 for White and c9 for Black) and the Rook is on the d-square (d1 for White and d9 for Black). 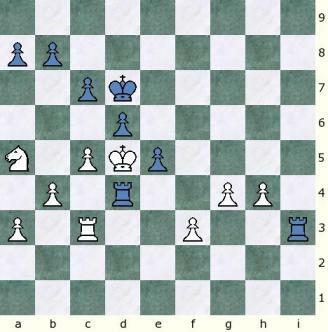 After g-castling (notated as O-O-Og), the King is on the g-square (g1 for White and g9 for Black) and the Rook is on the f-square (f1 for White and f9 for Black). 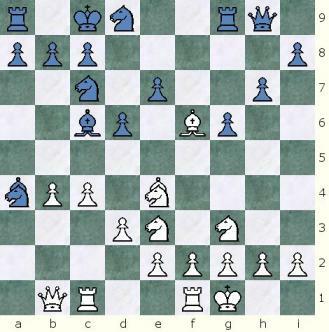 The King cannot jump over his own rook if and when said rook stands on a "checked" square. The Bishop Adjustment Rule is optional, and a player is not forced to use it. 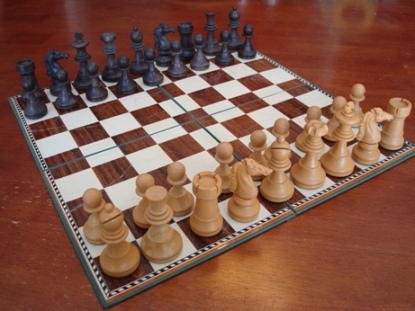 A player may choose to play with his Bishops on the same color squares if he so desires, even if his opponent chooses to adjust one of his Bishops. The Notation for the Bishop Adjustment is 'Bx <=> piece adjusting with', where x is the rank (column) the Bishop is at before the adjustment (i.e. Bc<=>Q stands for a Bishop on the c file adjusting with the Queen). In addition to allowing the Bishop swap places with a Knight, the Queen or the Minister (like in Maura's Modern Chess), it also allows the Bishop to adjust with a Rook, or the King! 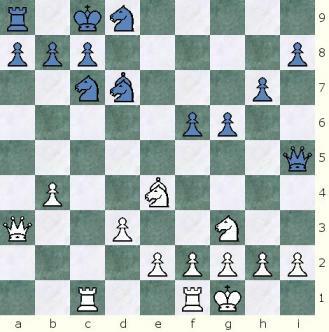 If the King is in check, it is not legal to move out of check with a Bishop Adjustment. 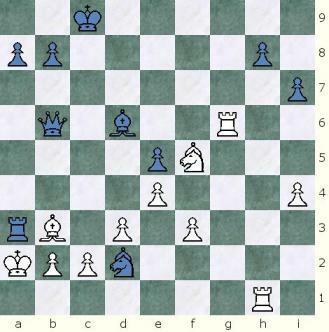 A King may not move into check after a Bishop Adjustment. There are 15,120 different starting positions in Modern Random Chess. First, lets place the Bishops. There are 9 empty squares, and since Bishops are allowed on same color squares, there are 9 posible squares to place the first Bishop and 8 squares to place the second Bishop. Since there is no way to differentiate the Bishops, and they are actually interchangeable, there is actually 36 of these 72 positions that are actually visually unique. After placing the Bishops, there are 7 squares left, 7 diferent squares to place the Queen and 6 different squares to place the Prime Minister. 36 x 7 x 6 = 1,512 visually uniquely different ways to place the Bishops, the Queen and the Prime Minister. 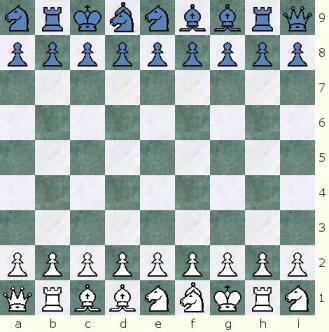 Modern Random Chess has been played on Chess Variants' Game Courier by players from the following countries: Puerto Rico, Canada, Mexico, Austria, Peru. The First MRC game ever! White had set up a trap! but Black didn't fall for it. After 11...exf6?? 12.Mxf6+! threatened checkmate in 2 moves with the Minister at d8. Now it's Black who sets up a trap and a checkmate threat at i2. After 20... Qxi2+ 21.Nxi2 Mxi2#, mate with the Minister. Black has threats all over the place! 1.e4 f6 2.d4 e6 3.Bc <=>N a6 4.f4 a5 5.g4 a4 6.a3 d6 7.Ned3 d5 8.e5 Nd7 9.Ne2 Ne7 10.Ng3 c6 11.Bf3 f5 12.gxf5 Nxf5 13.Nxf5 exf5 14.Mg3 Nb6 15.Qh3? 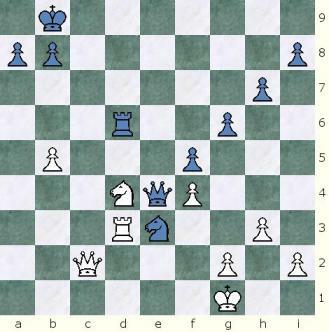 Nc4 16.Qg2 Qb7 17.Ka2 Me6 18.Rb1 Bce7 19.Nc5 Bxc5 20.dxc5 Bxc5 21.Bxc5 Mxc5 22.Mxf5?? Ne3! 23.Qg1 Qb3+!! 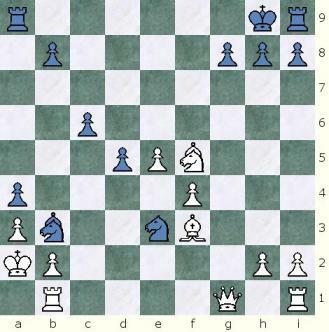 24.cxb3 Mxb3# 0-1 mate! 1.e4 f6 2.d4 e6 3.Mg3 d6 4.Nb3 Nf7 5.Nd3 Bf8 6.Qi6 g7 7.Qxi8 Nh7 8.Qi3 Ri9 9.Qh3 c7 10.Be3 e5 11.Qh4 Me7 12.dxe5 fxe5 13.Qh5 Nf6? 14.Qxf7 Bc8 15.i3 Bd9 16.Qc4 Bg6 17.Bi2?! Nxe4 18.Me2 Qc6 19.Qxc6 Mxc6 20.f3 Nf6 21.a3 O-O-Oc 22.Bg5 Be7 23.Nb4 Ma7+ 24.Kf1 Ng8 25.Bxe7+ Nxe7 26.Rc1 Me3+ 27.Ke1 Nd5 28.Nxd5 Mxd5 29.c4 Me3 30.Bh3 Bi4 31.Rc3 Mg5 32.Bxi4 Rxi4 33.Mg3 Ri9 34.Ke2 Rde9 35.Mf5 Kd8 36.h4?? Mf4+ 37.Kf2 Mxi1 38.Mg6 Kc8 39.Mxh8 Rxi3 40.Mxg7 Mg3+ 41.Ke3 Mf4+ 42.Ke4 Rg9 43.Mf5+ Kd8 44.g4 Mg6 45.Mxg6 Rxg6 46.Na5 Kd7 47.b4?! Rf6!? [... Rxf4+!?] 48.c5?? Rf4+! 49.Kd5 Rd4# 0-1 mate! I dedicate this variant to my cousin Herminio Quiles Matias who taught me to play Orthodox Chess during a family visit to Jayuya, Puerto Rico, when I was 10 years old. God Bless You! Thanks to Luis Menendez, from Manati, Puerto Rico, for introducing me to Maura's Modern Chess, and for giving me the original Modern Chess set below as a present. Thanks to Carlos Cetina, from Mexico, for giving me the clue needed to finish the definition of the new general Bishop Adjustment Rule. 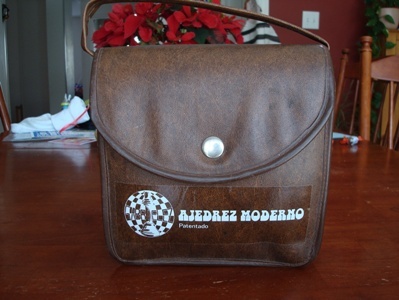 Modern Random Chess was created by Jose Manuel Carrillo-Muniz, from Puerto Rico in March 2008.